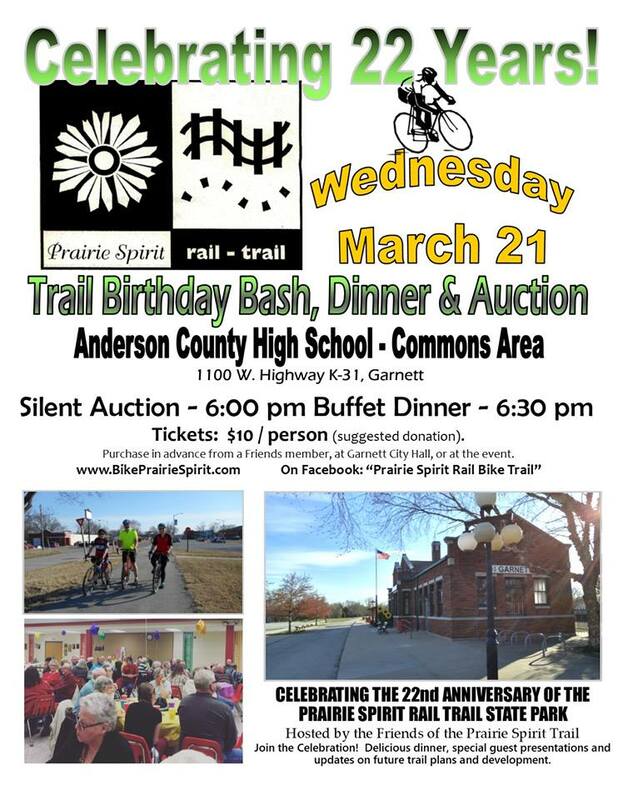 Come celebrate the 22nd birthday of the Prairie Spirit Trail with a birthday bash on March 21st in Garnett, hosted by the Friends of the Prairie Spirit Trail. The Prairie Spirit Trail officially opened on March 30, 1996. The trail was built upon what was once the LL&G (Leavenworth, Lawrence and Galveston) Railway and then the Santa Fe Railroad. Today the trail draws visitors from all over, and hosts a variety of bicycle rides and running events annually. The Friends invite the communities along the Prairie Spirit, trail enthusiasts and railroad buffs to a celebration dinner in the Commons Area of the Anderson County High School. The birthday bash will begin with a silent auction with a large assortment of themed gift baskets at 6 p.m., followed by a bountiful buffet meal at 6:30 p.m. Guest presenters will give updates on trail projects and upcoming Friends activities. Tickets for the event are $10 per person and can be purchased at Garnett City Hall, through Friends group members, or at the door during the event. The buffet dinner typically includes a wide variety of meats, vegetables, salads, and delicious desserts. The 22nd anniversary celebration is a public event and everyone is cordially invited. The Friends of the Prairie Spirit Trail invite you to show your support of the trail and the communities along the Prairie Spirit by attending.